My new friend Tommy who brought the hay. 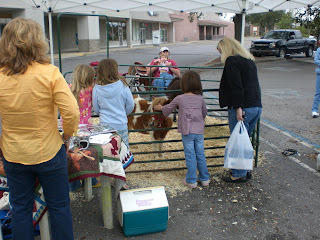 Mary Lackey--the awesome woman who loaded up her mini horses! Jason, my "little" brother, who came to check out the event. My friend Greg who came and made me promise to remember him when I become famous. ;) It was great to see you, Greg! One of the nicest guys I've ever met. 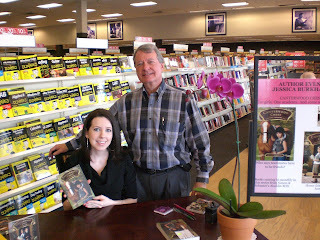 He's a retired colonel and he was so sweet. 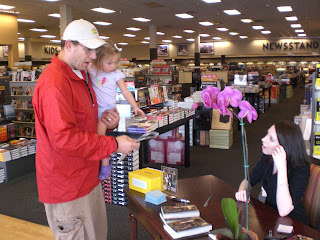 He even took video as I signed the book. Mandy M, can you see my awesome boots? My new friend, M! 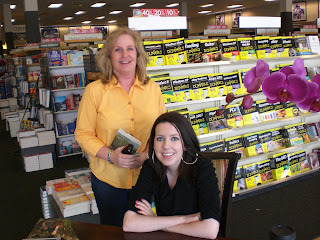 I even signed her copy of Young Rider. So sweet. I'm visiting her school soon. 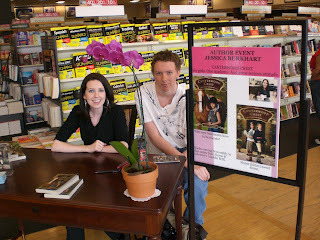 Minutes before the event began. Trying not to freak out. 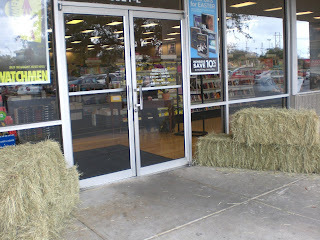 The set up outside the doors. I just sat down inside and hoped that someone would actually show up. 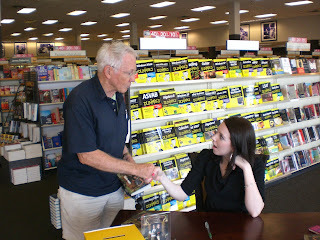 I was going through JA Konrath's signing advice in my head. It really helped, Joe. Thanks! Bill Bothwell, the community ambassador at BAM. He coordinated this entire event. Thank you, thank you, Bill. 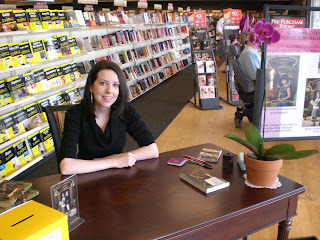 *Soooo, my first signing at Books-A-Million was AMAZING! We were under the threat of a tornado watch, yet people still came. I got started at 11am and by 2pm, it started to look scary outside. 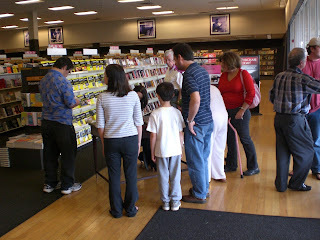 We closed up shop with zero books left. I met so many great people and had a blast. The girls that I met were so sweet and smart. I'll be visiting some of their schools soon and they promised to come up and say hi again. 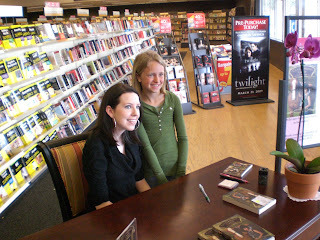 It was fun to meet readers and almost every girl had a horse story to tell me. Either they ride at summer camp, or rode a friend's pony last summer or even just petted a horse once. 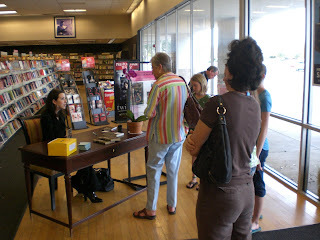 I loved talking to all of you and thank you for coming to see me! 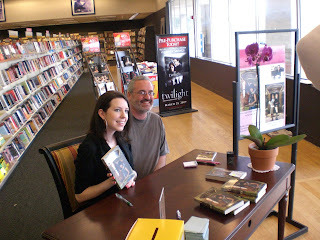 The entire signing was great and it was a wonderful first experience. :) I was super nervous last night! I think I was Twittering at midnight about how freaked out I was and I had to force myself not to call/text everyone in my phone for advice. Congrats on a successful event. Looks like it was loads of fun! congratualons, that it was sucessful! Congratulations on a great event!! You look so pretty!! 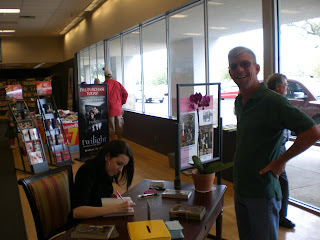 What a fun day for you to meet your readers!! Loved the pics! 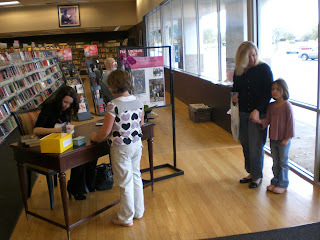 Looks like it was a really successful (first) book signing. Congratulations! I bet you had a great time! Oh, congrats! It looks like it went really, really well! !